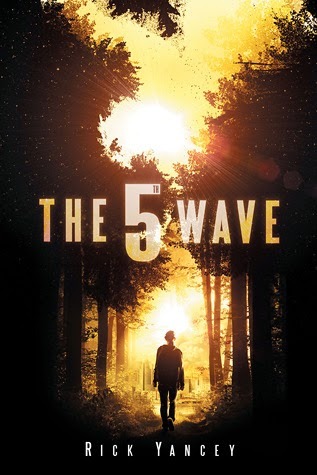 After the appearance of an Alien spaceship, earth has experienced 4 attacks know as waves. The worlds population has been reduced to a small, unknown number of survivors. Cassie is one of these survivors. In this new world Cassie quickly learnt that to trust is to die. But she may have to run that risk in order to keep a promise. I finished this book on Sunday (it's now Wednesday) and my immediate reaction was "Gimme the next one! "(which, unfortunately won't be released until later in the year.) I always have to wait a few days before reviewing a book because at first all I can think of are all the good bits about it and not the parts that irritated me, which I pushed to the back of my mind. "Time for the angrily-storming-out-of-the-room part of the argument, while the guy folds his arms over his manly chest and pouts." Nobody would ever say something like that, let alone a sixteen year old girl. Even if the author is going for a colloquial style, then he may as well make it relevant to the character. The story is written in first person, however the POV does change. The blurb led me to believe that, like The Hunger Games, it would all be written from the point of view of Cassie. I didn't mind the change, and I sometimes I preferred the other chapters, but it annoyed me that the blurb made the book sound like it was all about Cassie when it was just as much about a guy called Zombie. I read several reviews and I noticed lots of people didn't like the change in POV, particularly as it didn't state who the perspective was at the beginning of each chapter where it swapped. This apparently created a lot of confusion. I, however am used to books where the POV switches without warning, in the Malazan Book of the Fallen series for example the POV frequently changes within chapters. Each POV should sound different, especially when it's in first person, because everyone thinks and feels differently, and if people struggled to differentiate then obviously the POV's weren't well written. One thing that really bothered me was Cassie seemed to switch between being all like "Screw you Aliens! Bite me!" to "I'm so insecure. I miss my high school crush who I talked to like once 5 years ago. Family? Friends? Why would I grieve about them when I can grieve about a guy who didn't know I existed." Okay, I added the last part, but she did spend more time thinking about him than anyone else. I'm so sick of unhealthy relationships in YA books. The women are supposed to be strong and brave, but as soon as boys come into the picture they either become like Katniss who cold, indecisive and indifferent. Or like Bella who becomes obsessive. Where are the Hermione's in recent YA literature? Lastly, I didn't like the Aliens. They were too heartless. Too easy to hate. Excluding one character, there was no evidence to suggest that the were good at all. As I've grown older, I generally prefer books where it becomes difficult to hate the enemy, because that makes it feel more real and I honestly enjoy being torn between sides in literature. However maybe in the next book the aliens will become more likable. As this book was written in first person by humans there is obviously bias in the narration, but I hope to see more conflicting POV's later in the series. Okay I could rant about this book for ages, especially as none of my friends have read it. But overall I give this book 3 1/5 stars out of five. It's a good read if you not picky and just want a trashy YA dystopian novel to read. It does get the reader hooked, however it is inconsistent in its quality. Hopefully in the next book Rick Yancey will have found his voice and it will be more consistent. Thanks for reading. Comment if you think of the book or if you found this review helpful or unhelpful.